Adam Vjestica is a freelance writer and the Editor-in-Chief of Sumonix,a big-bellied video games website full of features, reviews and full fat gaming. You can follow Adam on Twitter at @AdamVj23. Maybe it’s infused into humanity’s DNA. The instinctual hunger for power can lay dormant for years, suddenly awakening at the most opportune moment. Some cannot satiate their appetite, with the promise of fame, fortune and glory an irresistible prospect. Unfortunately, there can only be one who holds the ultimate position of power. Only one who can be worthy of holding the Power Stone; a stone which can make your wildest dreams come true. Talk about an attractive proposition! Power Stone was unlike anything I had ever played. Frantic, fast, hilarious and genuinely exciting; the game was a mad dash to grab enough gem stones (whilst pummelling your opponent) to transform into a powerful, near-invincible bringer of destruction. Two players battled it out in beautiful, interactive environments, littered with powerful weapons and objects which could be used to force your opponent to drop their precious stones. That’s right, you could literally be one stone away from transforming when BAM! , barrel to the face, a stone scatters and you’re suddenly staring helplessly as your opponent collects what was once yours. This back and forth gameplay created truly unpredictable counters, as you relied on your character’s combos, the environment and ultimately, the ability to efficiently collect the stones in your attempt to win. After collecting three gem stones, which appeared randomly across the map, the transformed player had access to a long range special move and a close-range special move. If performed successfully, the character could inflict significant damage to their opponent, considerably shaping the battle in their favour. 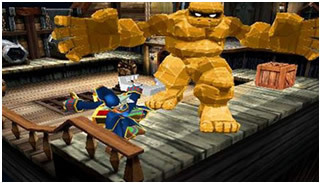 It was vitally important to judge the timing and position of your moves, as if you misjudged it or took too long (the power up only lasts for a short period of time), your character is consequently stripped of the stones, scattering them across the map. There were ten characters to choose from and a number of different environments to compete in; my particular favourite was a delightful, Japanese garden. 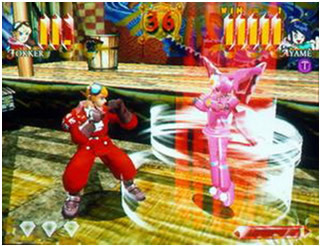 Each character was quirky and unique in their fighting style and appearance, with a cartoony graphical atheistic complimenting the game’s attractive qualities. The often inventive gameplay truly felt next generational, a refreshing and bold approach after the wave of 2D fighters that dominated the market. I salivate slightly when I think about how glorious Power Stone could be if placed in the hands of the right developer if it was to be recreated this or in future generations. Extremely detailed barrel to the face, scattering even more gems in a bigger wackier environment? Please make it happen Capcom! I’ve even thought of a fantastic slogan for Power Stone 3. 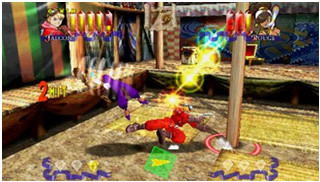 Power Stone and its sequel Power Stone 2 were later ported over to the PSP, providing accessible pocket power to the masses. The gameplay holds up extremely well to this day, even though the lack of modern features such as competitive online play are unfortunate. If you haven’t had the pleasure of battling your mates in this fantastic, fighting thrill-fest then I encourage you to check it out.